At Ring, our mission is simple: To reduce crime in neighborhoods. And by putting the power of home security in your hands, we're making that mission a reality. Ring keeps your home secure and your family safe by protecting you against intruders, burglars, package thieves and any other unwanted guests. Ring makes sure you never miss a visitor. Because with Ring, you're always home. 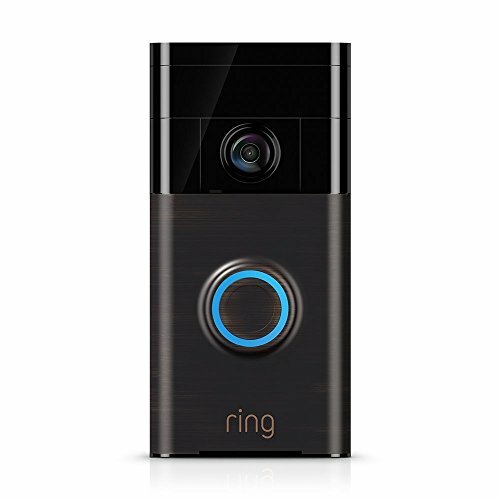 Ring Video Doorbell lets you answer the door from anywhere. Whether you're halfway across the world, or just too busy to walk to the door, Ring lets you see, hear and speak to visitors from the comfort of your smartphone, tablet or PC. Ring Video Doorbell comes in four color options, so you can pick a finish that fits your home and your style. It's weatherproof construction and infrared night vision means you can monitor your home around the clock-day or night, rain or shine. Wi-Fi connectivity and Versatile smartphone compatibility: Works with select iOS and Android devices. Download the Ring app to view footage and receive alerts on your mobile device: You can keep an eye on your home and speak with visitors, all from a remote location. Record wide-angle high-definition video: Maintain a clear view of your home's entrance for optimal security. Optional Cloud recording lets you view footage at a later time. Night vision and Automatically record footage and receive alerts when motion is detected: Motion sensors let you know when someone is at your door. Infrared LEDs allow you to record footage, even in dim lighting. If you have any questions about this product by Ring_Doorbell, contact us by completing and submitting the form below. If you are looking for a specif part number, please include it with your message.